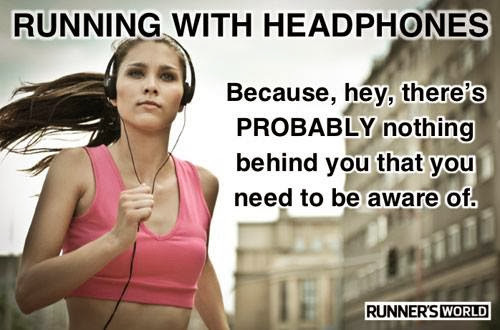 For whatever reason, whether or not runners should listen to music while running has become a topic of debate. I usually love debating, but I kind of hate any controversy that serves to drive a wedge between groups of runners. Barefoot vs. traditional? Zero-drop vs. cushion? I don't want to hear it. Do you. That's why I was surprised when Runner's World's Facebook page posted an image a few weeks back that opened the floodgates for heated debate that was filled with un-runner-like animosity. People feel really strongly about this, apparently. The image in question...the comments on this from both sides of the debate were simply ridiculous. 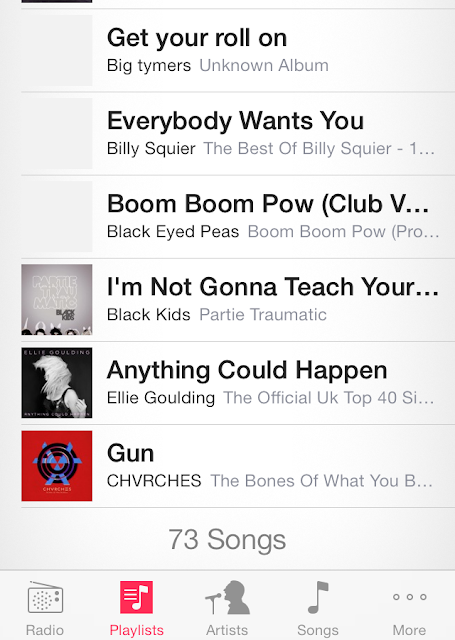 When it comes to my choice, I like to have my music with me when I run. I can run without it, and often I run without headphones and just let the ambient soundtrack play from my phone speakers, but if I had my druthers (can you tell I'm reading To Kill A Mockingbird right now?) I'd choose my Run It! playlist and Yurbuds any day. My music falls into three main categories and a sub-genre, but I mix them all together into a single playlist because I like to hit all three areas of my mood, rather than choosing a mood and sticking with it the entire run. Anything catchy, upbeat, and fast-paced falls into this category. 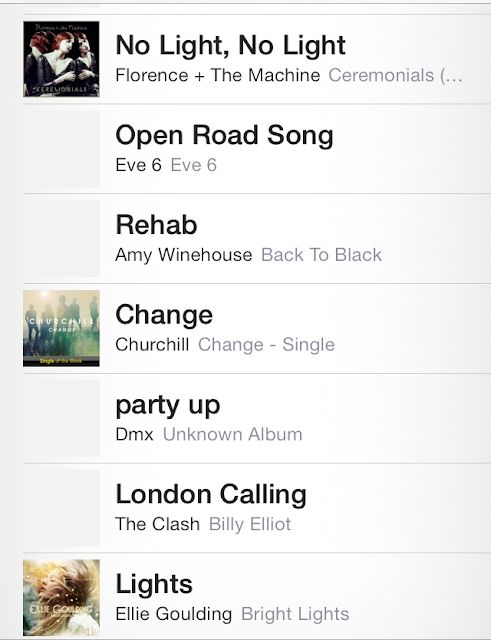 Of course, there's a fair amount of unexpected alternative and rap here too...Who can say no to DMX or The Clash? They clearly go together. These songs kick up my pace, and usually I can be found mouthing the words or pretending I know how to play air-piano while running. Probably my favorite songs, but the least-represented on my playlist, my zoning out songs are sometimes slow and may seem like the antithesis of workout music. But they follow a very important rule: I know every. single. word. Matchbox Twenty (oh my gosh, favorite! ), Goo Goo Dolls, The Spill Canvas...These are the best when I take the playlist off shuffle and let a few of them play in a row, especially if I'm well into a long run and facing some tough miles. I love Nike+ for having this option. Adding power songs to my playlist lets me hear exactly what I need to at any particular moment with just a tap of my phone screen. (Seriously, people who ran with Disc-Mans and Walk-Mans? How did you do it?!) Most of my power songs are about overcoming something. I've got "How Far We've Come" by MB20 right alongside "No More Drama" and "Work It" by Mary J. Blige. And for some reason "Backstabber" by Ke$ha is super effective. If you've even glanced at the pictures in this post, you know what I'm talking about. 3OH!3? Gangnam Style? Avril Lavigne? Yeah. 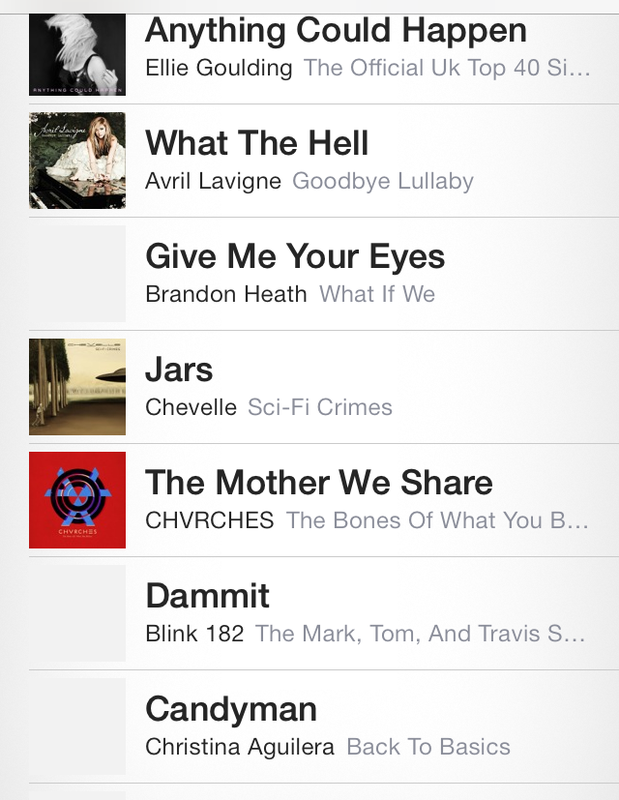 You need some space for embarrassing music that you genuinely love on any running playlist. A run simply wouldn't be complete without it! As far as running races goes, I've never run a race that was so crowded with spectators and entertainment that I felt I was missing something by having my music going. I guess if I ever run a Disney race or any show-stoppingly huge race, I'll stow my headphones. But for the most part, I'm just a music lover. Music gives me a way to deal with my head; the beauty of music is that it speaks to us in a way that is personal and intimate but also universal. If running is the perfect time to get my head straight and refocus my emotions, then what better companion is there to run with than a good playlist? Do you run with or without music? What about at a race? What are your top music choices right now? Andrea at Morning Runner Girl nominated me for the Sunshine Award! I know I've done this before, but her questions were just too fun not to answer. 1. What is the craziest thing you have done? Okay, maybe not crazy, but definitely something that took a lot of guts...going on my Birthright trip to Israel two summers ago. It was something I had wanted to do but kept putting off, and it was the most rewarding, eye-opening, and moving experience. I'm so, so glad I took the leap and did it. 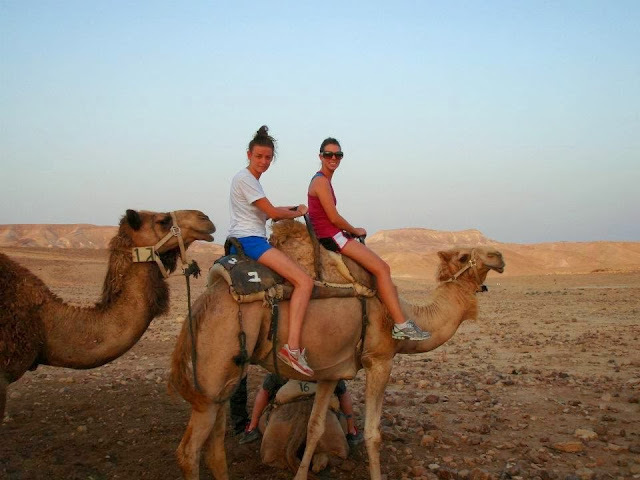 Riding a camel in the Bedouin camp. 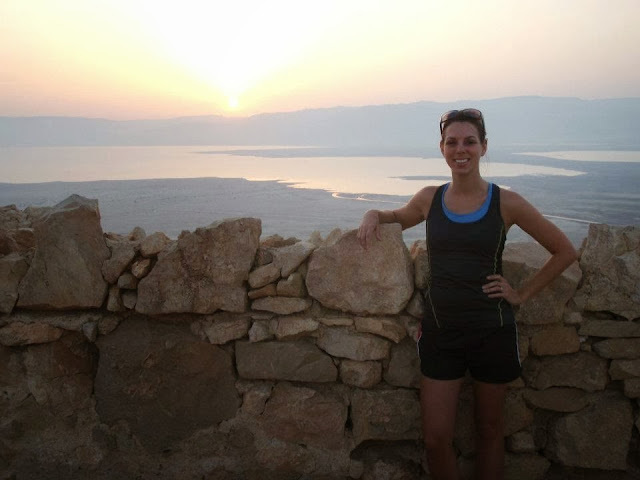 We hiked up Masada for sunrise. 2. Hot weather or Cold weather? Cold! Of course, it's all relative It's hot 90% of the year here, so "cold" to me is now anything below 70 degrees. If we're talking snow, I'd have to take hot weather! Wine, hands down. (Most beer isn't gluten free, so that's an easy answer.) I prefer Merlot these days. 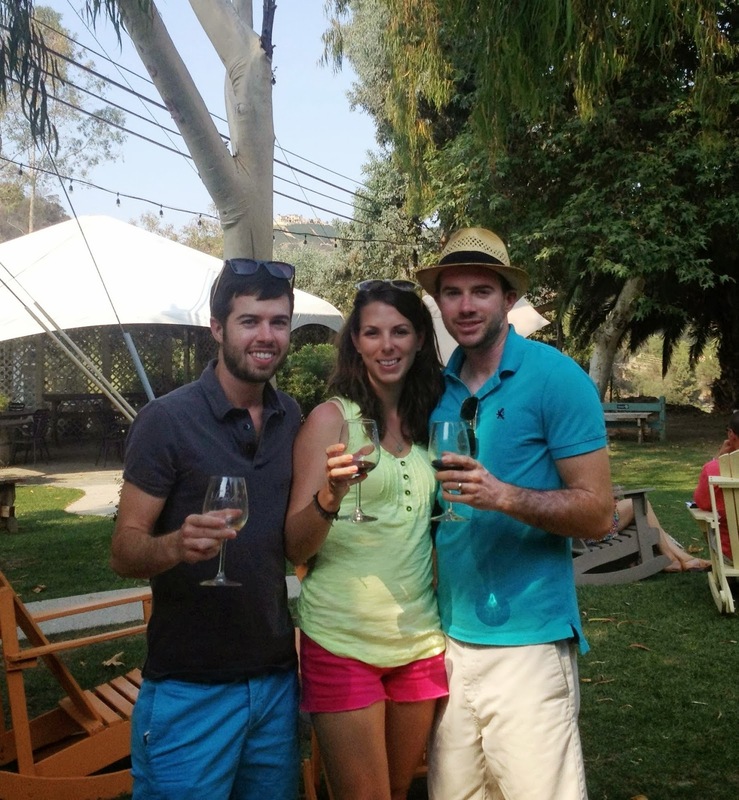 The winery in Malibu was one of the highlights of my CA trip this summer! 4. What do you do when you first wake up in the morning? Wash my face. I have mild OCD when it comes to bathroom activities and the order in which I have to accomplish them. I could be running an hour behind schedule and I'm still going to stop and wash my face. 5. What is your favorite thing about the city you live in? 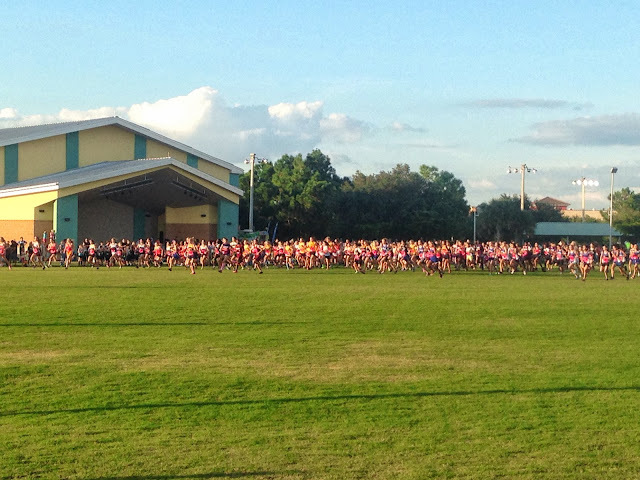 We are really blessed to have so many track clubs nearby, so there are always races within a 30-minute drive. 6. What’s one thing that can immediately brighten your day? When I genuinely make Matt laugh. I'm not really that funny, so when I do something that can cause a real belly-laugh, I'm in heaven. Also, receiving notes and letters from students. They make everything worth it. Just some of the notes I received at the end of last year. Seriously made my entire summer. 7. What is one book that you can read over and over again? I reread the Harry Potter series every summer...all 7 books. I always get something new from it. The story itself is beautifully written, and there's so much nuance and allegory...I could teach an entire year's curriculum with just that series! 8. Have you met anyone famous? 9. What is your worst habit? 10. What is the best Halloween costume you have ever worn? 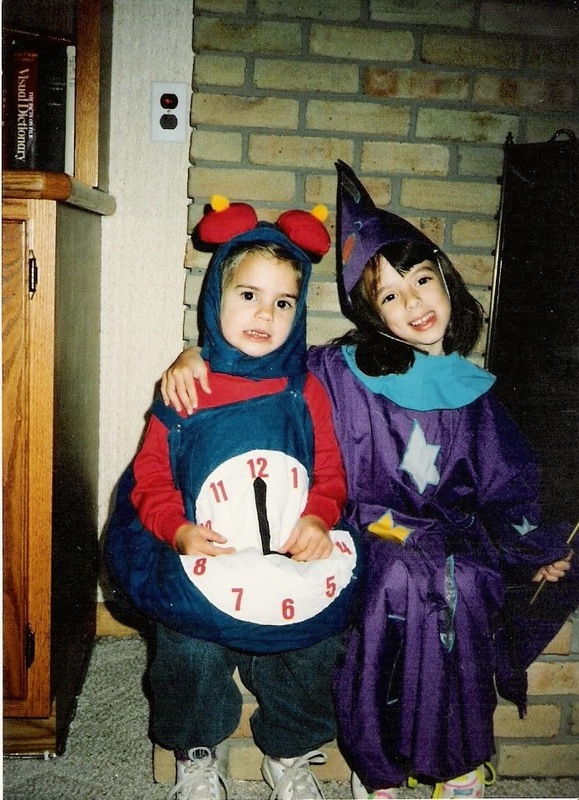 Isn't Steph the cutest clock ever? I think this needs no explanation. I was born to be obsessed with HP. First of all, last year's race was pretty much under the most perfect conditions I could ask for. 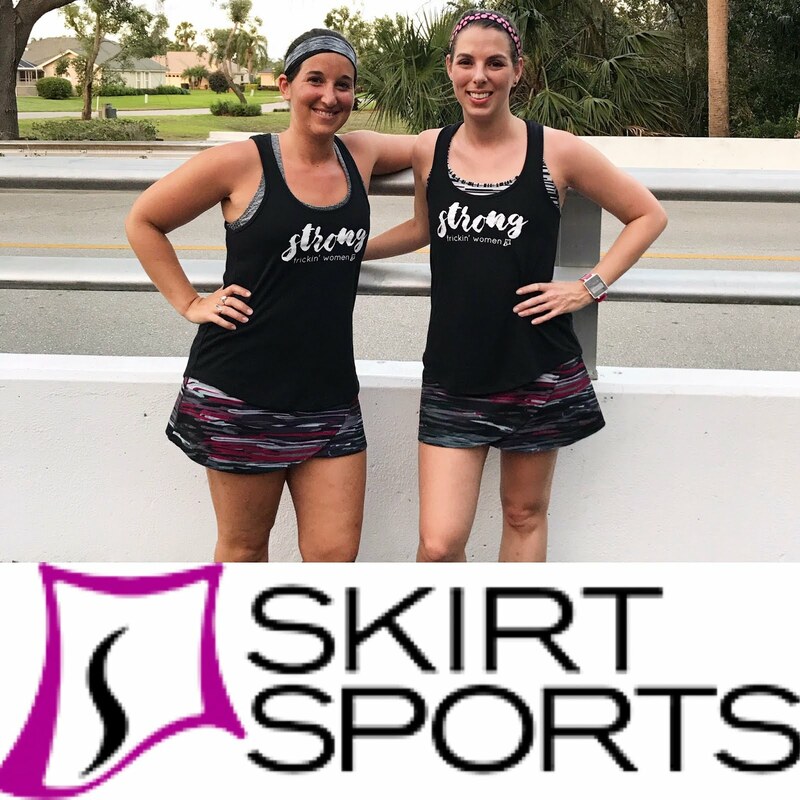 I was in the end of serious half marathon training, injury-free, with an 8-mile long run under my belt, and the weather had been in the 70s to boot! I knew going into the race this year that I wouldn't be as strong. 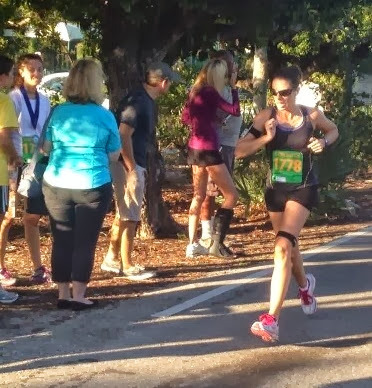 It was my first race since July and I had just taken two full weeks off from running because of that mysteriously painful foot lump I had going on. I adjusted my goals accordingly. Strong coffee is a must pre-race. There was no way I was going to run sub-60, but my last 10k was 67 minutes and I knew I could beat that. I was secretly hoping for 62, but decided realistically (because of the lack of training) that 65 was fair. My other two goals were to 1) genuinely and truly enjoy the entire race, and 2) finish injury-free. The morning started out bright and early...because the moon has been monstrously huge the past few nights. How is it this bright at 5am?! 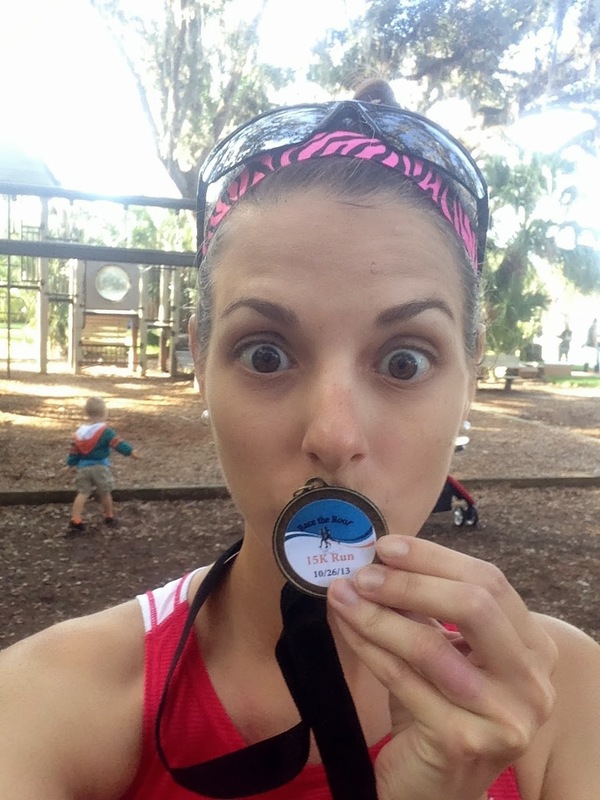 I was excited for this race because it would be the first one I got to run with half of my Ragnar team! Lisa, Daniella, Tracey, Sarah, and I rode together and met Meg at the starting line. It was awesome to be surrounded by race energy again. The moon stayed up even as the starting line began to fill in. I feel beyond lucky to be on a team with all these women. They're supportive, genuine, hilarious, and totally honest. Some of them are crazy fast (I'll get to that in a bit), but none of them put pressure or unfair expectations on each other. We are all about just having a blast and running our own races, and that was really important to me this year. Pre-race: Meg, Daniella, Lisa, Sarah, me, and Tracey! I had the advantage of knowing the route this year. I remembered the packed-shell loop from mile 4 to 5.5, and that last year it was surprising but a nice break for my legs after running on road. I constantly reminded myself of that example to refocus my anxiety into positivity. As usual, the race was extremely well-organized. There were tons of cameras out (which is why I was excited to see them...alas, they're not up yet) and I made sure to smile at and thank each photographer and all the volunteers. 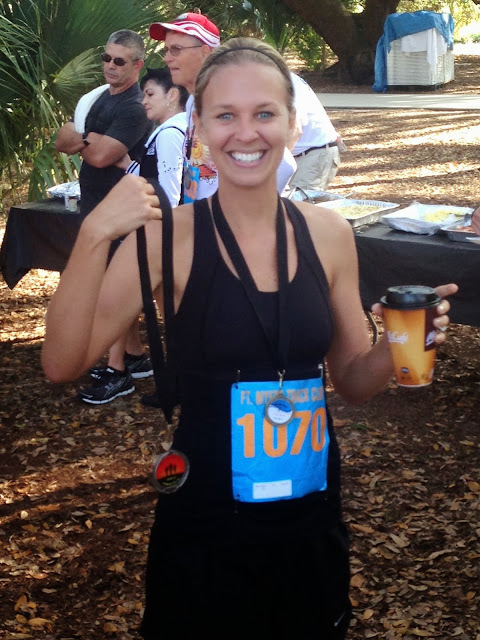 I ran the entire race and was totally pain-free (goal met!). Awkwardly trying to wave while running. I wore my "transcend" bracelet and found myself using that mantra quite often. It wasn't an easy race by any means. Especially compared to last year. It was ridiculously hot and humid, even before the sun was up. My legs weren't as ready as last year, either. But as I ran, I remembered to look around. The best part of this race is the scenery. The entire route cuts through gorgeous tree-lined roads and lush green fields. It was easy to remind myself to just enjoy it. I was glad I was running again; that my foot was 100% pain-free; that I was here with new friends; that I was racing again. 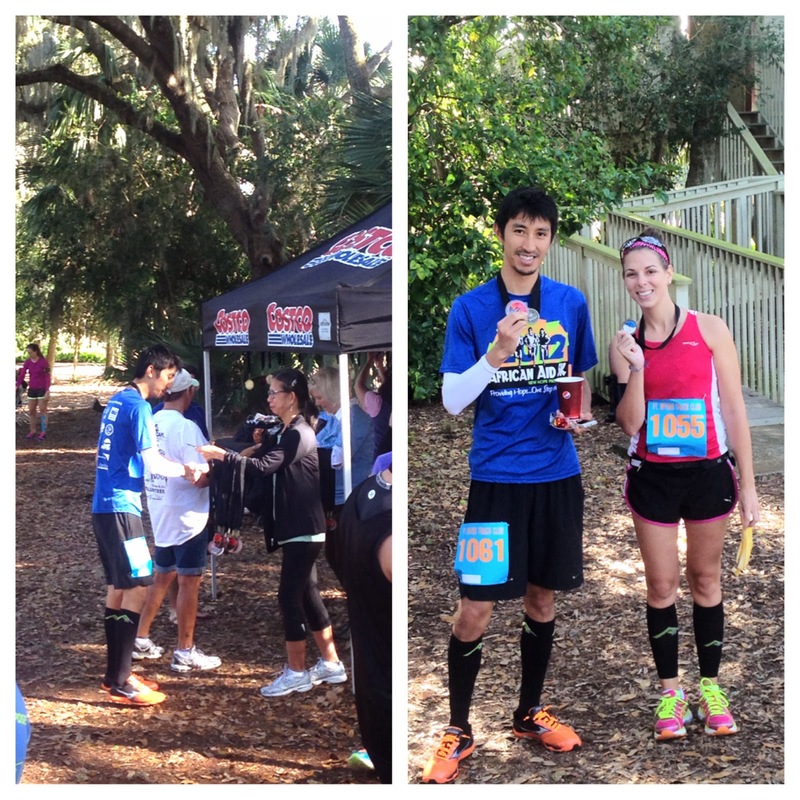 Post-race, basking in our various accomplishments! Above all, I reminded myself that I was running my race. That my expectations weren't to relive last year, but to be true to myself and to be honest with where I am right now in my running. I took a deep breath every time I started to feel pressure and reminded myself that this race was about much more than hitting a certain time goal; it was about coming back to running with a fresh outlook and a renewed love for this sport. A more honest picture of us post-race. After the race, we learned that Sarah - who had run exactly one race before this, a 5k - had placed 3rd in her age group! She is super fast and a natural runner...she only started 4 months ago! On the ride home, I discovered Tracey belongs to the same sorority as me, which was an extra bonus. I also learned that Lisa lives literally just down the street from me in one of my favorite running neighborhoods. Basically, it was a perfect day. When I got home, I showered and napped. Then I had a nice breakfast and added my bib and medal to my collection. It wasn't my fastest race, but it was definitely one of my best...for all the right reasons. Last night's run was rough. My legs felt like lead from the beginning, the route we took was short so we had to do quite a few repeated loops, and my body just felt like it was moving through wet cement. Did it turn into an "I'm glad I went!" run? Kind of. I mean, today I'm still disappointed in how it went, but I'm glad I went. Before the run, Matt and I went to the last XC meet of the year. A bunch of my students are on the team, and it was emotional to watch them run. In middle school their meets are 2 milers, so that's what they ran. Our top girl came in 9th of over 250, making it to states in November, and finished in around 15 minutes. All of the girls had strong races...most PR'd. The boys went the same. The best part was that at the end of their race, the girls stayed to cheer the boys on...and like true runners, cheered for every boy from every school. Talk about a "the kids are alright", feel-good moment. After the meet and the run, I was not at all hungry. My dinner was an avocado. Delicious, but not really balanced. Saturday is my 10k. Last time I ran it in about 58...I'm hoping to break 62 this year. 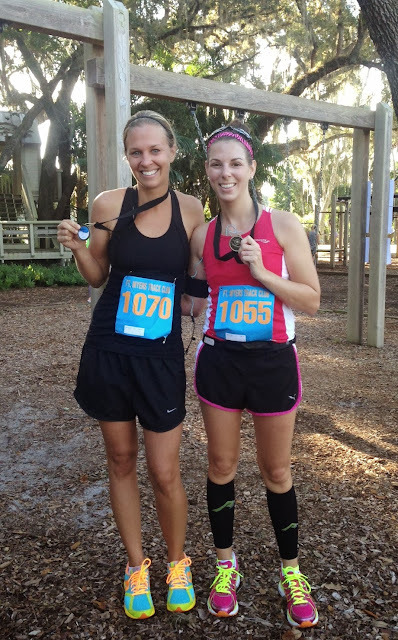 My last 10k in May was 67, so I know if nothing else this will be a more positive and fun race for me! My finishing sprint this time last year. Look for a race report sometime this weekend...maybe I'll even have pics! What's your favorite race distance? Are there any races you like to run yearly? 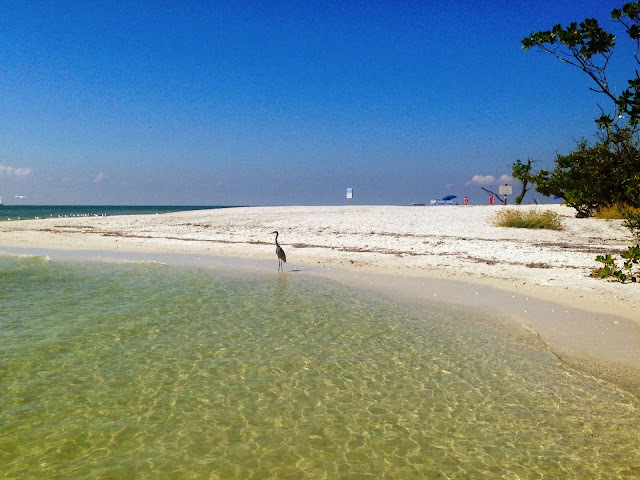 This whole "week between posts" thing isn't purposeful, but unfortunately, blogging is at the bottom of the totem pole as far as concerns right now. I've been having a pretty down couple of weeks. Not just because I've been easing back into running and having to take it slow is a little depressing...But that's part of it. Report cards are in, and the clean slate of a fresh quarter feels freeing. I'm hoping that "free" feeling sets in soon, because right now I feel as stressed as ever. And unfortunately, that's rolling over into my fitness life. Have I mentioned lately that I've realized that I kind of hate "working out"? If I'm going to be active, I prefer a whole-body activity that's fun and helps me forget I'm staying fit. That's why I love running...it doesn't feel like exercise! It's also why I'm quickly becoming a SUP addict. An evening paddle on the backwaters. This past week, my Ragnar team met to discuss team names, payment plans (holy expensive race, Batman! ), singlet designs, and more! I'm so excited to get to know all the women on the team better. I work with two of my teammates, but the others are virtual strangers (or "friends waiting to be made"). Matt's in the center, hauling tuchus! Of course, SUP is a relatively new sport and the races are smaller, but still. He's definitely found his niche. My foot was completely pain-free during the run! Now that I'm refocusing on a shorter distance race to end the season, I feel a lot happier and less stressed about meeting any goals. I'm just letting my foot heal, enjoying myself, and running because I want to. This will be my first half marathon run alone, so it will be a milestone no matter what. 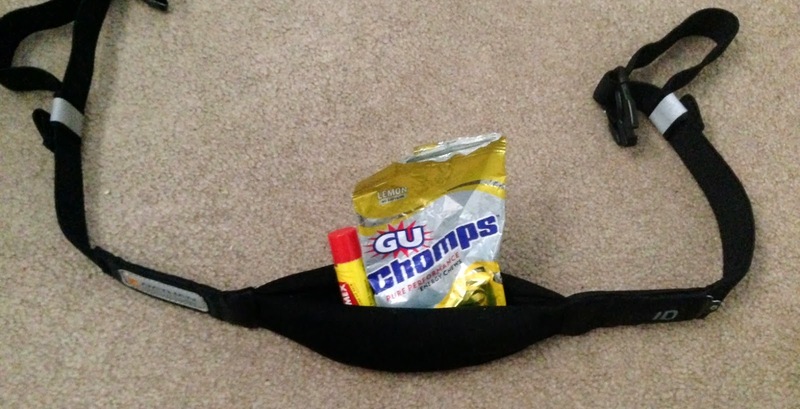 I'm really looking forward to relying on myself for the entire race. And they're my favorite, to boot. What interesting fitness activities do your friends or SO participate in? Are you excited that The Walking Dead is back? I AM! What cheers you up when you've been down? Besides running and blogging, what have you been up to this week?